Undefeated featherweight Miguel Flores, 10-0 (6 KOs), returns to the ring after a seven-month layoff on Friday, Feb 17, at the Legends Sports Complex in Spring. At press time, his opponent had yet to be determined. Flores, 19, attributed his bout of inactivity mainly to the increasing difficulty in finding opponents as he gains more exposure and boosts his visibility. Opponents have little to gain and much to lose by taking him on since he is at that stage where he is considered dangerous but not yet a big enough name for them to want to risk a loss. He is hoping to be scouted and signed by one of the major promoters as he continues to pad his resume. After 10 professional bouts, he has become a more composed and composite fighter, he said. "It's a long process and I think I've matured more in the ring," Flores said. "If you get hit you've got to stay calm. You can't just go for the knockout. You've got to relax." 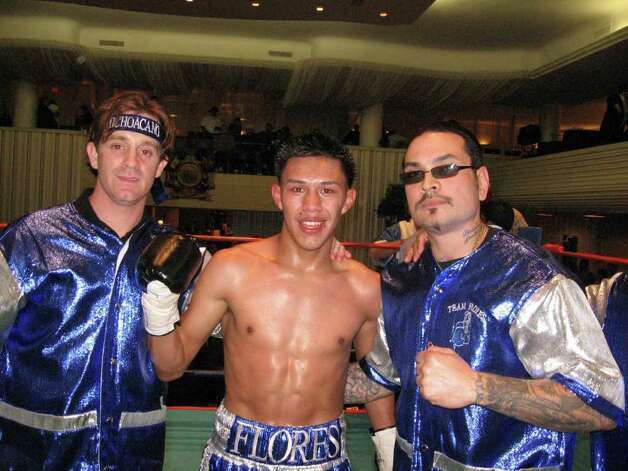 Flores exited the amateur ranks with a record of 80-10 and turned professional as soon as he became age eligible at 17. He fought his first pro bout in August of 2009, barely four months after his older brother Benjamin, 19-3 (6 KOs), lost his life in the ring. Flores has dedicated his career to his brother, his role model and mentor, whom he credits for imparting a skill that has become his best asset in the ring – the left hook to the body. Virtually all of Flores' knockouts have been the result of that debilitating blow zeroed to the liver. "You don't get to see a lot of knockouts in the amateurs but I had a few and they weren't from shots to the head," Flores said. "I worked a lot of punches to the body and, of course, I learned that from my brother. My brother learned that by copying (Marco Antonio) Barrera and (Julio Cesar) Chavez and that's where we learned how to throw that shot." While aware of how devastating his left hook can be, Flores is determined not to neglect the other weapons in his arsenal and evolve into a one-dimensional fighter. "I've thought about it a few times, about what if, against some opponents, the body shot don't work no more," Flores said. "That's why we're working on mixing all kinds of punches and working behind the jab. Great fighters like (Juan Manuel) Marquez can throw uppercuts and mix the body punch with shots to the head." At the same time, he said, he has been working on acquiring more fluidity and better rhythm in the gym to improve his defense. "My offense is good, I land the punches but sometimes I don't move my head enough so I'm there to be hit," Flores said. "Also, I've got to start throwing more jabs and working my way in with the jab." Undefeated lightweight Bahodir Mamajanov, 8-0 (5 KOs), of Uzbekistan, has been an invaluable sparring partner for Flores at Hank's Boxing Gym. A southpaw, Mamajanov punches from unorthodox angles, Flores said, forcing him to think outside the box. "He's a left-hander and fights kind of like (Manny) Pacquiao," Flores said. "He's been helping me a lot to develop my patience and my game plan." Flores also spars regularly with O'Shanique Foster, a former national champion who won a spot as an alternate on the 2012 US Olympic team. Other fights on the card include a heavyweight bout between Eugene Hill, 25-1 (17 KOs), and Charles Spears, 4-9 (4 KOs). Junior welterweight Juan Copado 3-0 (1 KO) faces Fabian Cancino, 0-2. Local welterweight Rogelio De La Torre, 6-1 (4 KOs), is also scheduled to fight. The card will be the first staged by Sosa Promotions. Peter Lim is a freelance writer and can be reached at neighborhoods@chron.com.